I confess to a great dependence on Annual Reports. When you’re seeking information on grants and granting agencies, sometimes few things can tell you as much about an organization as what they choose to tell you–which is why I am such an avid reader of OHA’s reports. Well, what’s good for the goose and such. Much as OHA looks with satisfaction at its own projects, so do we at Grassroot. And our aims aren’t as different as you might think. We both want to improve Hawaii and the situation of all Hawaiians. It’s just how we interpret that and carry it out that makes all the difference. And also budget. I’m willing to bet that OHA spends more on office supplies than we do on . . . well, pretty much anything. But I digress. The point today is to let you know about our newly-released Annual Report. Consider it the curse of being active–by the time you finish describing all the accomplishments and activities of your previous year, you’re already well into a busy and productive new year. 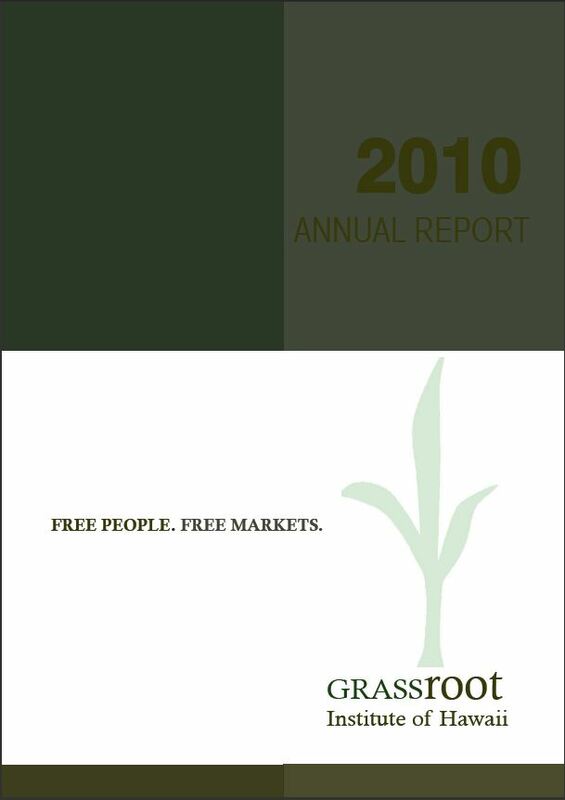 And yet, it would be a shame not to draw attention to the recently published Grassroot Institute of Hawaii Annual Report for 2010. We’re proud of what we’ve done to champion liberty and accountability in Hawaii over 2010, and we’re continuing that work now (and with your help and support) into the future. Which foundations gave $335,000 to Grassroot Institute in 2010? How many total members belong to Grassroot Institute?